My name is Roz Fruchtman. Unless you’ve been living under a rock, you’ve noticed that LIVE Video is all over. Facebook LIVE has become the hit of the century, NOW in Facebook Groups! Personally… I LOVE LOVE LOVE video, but have not always felt comfortable in front of the camera, NOW simply EVERYONE, ANYWHERE and for ANY reason can get on camera and command an audience. People love it. Why? Because they get to connect with you in a more personal way. By seeing you on camera it’s the next best thing to being there. IN FACT… You can chat LIVE during the LIVE video events (or not). With Facebook LIVE you can even record offline and then once you are done, it is uploaded to your Facebook Profile and only days ago Facebook LIVE came to Facebook Groups – OMG! The possibilities are endless!!! Trust me, there is GREAT POWER here! My friends and mentors Jeff Herring and Mike Stewart are teaching a course where all the hidden secrets to LIVE video are unveiled. Mike Stewart is the Audio/Video Guy and Jeff Herring is the Content and Repurposing King, now turned Video Content Guy. Between the two of them, LIVE Video genius is unleashed. Live streaming video from a smartphone/ipad and now even Android device is exploding. Periscope, Blab and now Facebook Live make it possible. You have the phone, the apps are free or dirt cheap, and the world wants to hear your passion! My friend Scott Hamlin just released a really cool app called Easy Animator Pro. He’s been working on it most of this year and decided to launch it by making a Lifetime Update Membership for Easy Animator Pro for the first 1000 people who grab it. Scott has built Easy Animator Pro to be easy to update with new animations so he is working on adding more all the time. The app can already create over 4.5 million different animation possibilities and on the video, on the sales page, he shows you a preview of his first update that will add a lot more cool animation options. Scott is offering the Lifetime Upgrade option for an early bird $10 off for 14 more hours, so don’t wait–check out this very cool and fun app and get it before the price goes up. 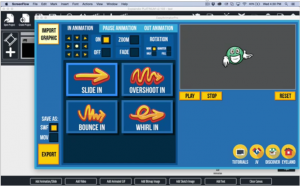 CLICK THIS link to see a video demonstration and/or get your copy of Easy Animator Pro NOW. http://rozfruchtman.com/EasyAnimatorPro (YOU’RE GONNA LOVE IT! to see a video demonstration and/or get your copy of Easy Animator Pro NOW. You DO NOT have to worry about those tedious upsells… It’s just a unique and powerful app. Not only that, in the member area Scott tells you how you can get his Easy Vector Editor app for FREE! Easy Animator Pro will have a much bigger public launch in a few months, but it will be at a higher price and it will NOT include Lifetime updates, so pick it up now while you can. Looking forward to rocking the video world with you in 2016 ~Roz! Unless you are living under a rock or have no TV, Internet or Radio you’ve heard about the Adult Coloring Craze. Most people are using their coloring designs to create Adult Coloring Books. But what if we can show you a unique way to use your designs? In a way you may not have thought of yet? Instead of just creating the same style of coloring books, as everyone else, why not use those same designs to create brand new, unique gift ideas that the entire family would love? Even kids and teenagers will love your new products. Today, we have the perfect idea for you. One that will have you cashing in on the holidays in a way you never thought possible. Our Cash In On Coloring for the Holidays Report contains 10 fantastic ideas that you are just going to love. Plus this report comes with PLR – Private Label Rights. This means that you can edit and brand the report as your own. Imagine what your customers or readers will think when you present them with this guide. They will become solid fans and followers for years to come. As well as using these ideas for your own products. You now have a brand new product to sell! What could be easier? This is the perfect way to enter this amazingly popular niche by offering a product that is totally different. When I signed up to take coloring page creation classes, I was more interested in the strategy than primarily creating Coloring Books. I felt there was more that could be done with the images. As the trend grew, we see that there is! On a personal level, I find so much joy and relaxation in coloring that I’m surprised myself ;). The possibilities are endless. There is a whole coloring world out there! We’re looking forward to you joining us! Have you ever needed a quickie mascot and had to check all over and finally come up with something that everyone else was using? NOT anymore. Check out Mascot Anything by Scott Hamlin. You’re gonna love it like I do! Mascot Anything is a growing collection of cartoon art that you can use to create mascots and characters either with the art provided or add eyes, mouths, hands, and cartoon effects to your own art to create your own unique mascot. No graphic experience? No problem! You can use their FREE Easy Vector Editor app (Mac and PC compatible) to create your mascot. See the video (on the Mascot Anything Website) for a quick demo to see how easy it is! You can also join the Mascot Anything community on Facebook for FREE add ons, tutorials and cool ideas! It’s never been easier and more fun to Mascot Anything! … for Jim Edward’s and Jeff Herring’s Custom Content Wizard! This Wizard Makes It Insanely Easy To Create Excellent Articles, Blog Posts, and Videos – FAST – And Use Them On Your Blog, Social Media, YouTube and More! Use this wizard to instantly outline content you can create yourself — or outsource quickly and cheaply — to then use anywhere to drive traffic, make more sales, and put your content marketing on auto-pilot! … LITERALLY anywhere you would need targeted, custom content, now you can have it outlined using 21 proven “custom content templates” at the click of a mouse!